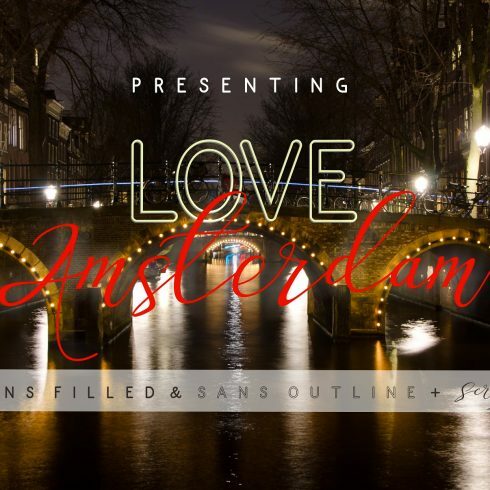 This font is made up of irregular and flowing letters, and has a charming dancing look, and is added with Love Amsterdam sans & outlines making it suitable for printing needs like invitations, books, magazines, calendars, business cards, clothes, banners brochures and menus, and more. To enable the OpenType Stylistic alternates, you need a program that supports OpenType features such as Adobe Indesign, Adobe Illustrator CS, CorelDraw X6-X7, Microsoft Word 2010 or later versions. A web font is a group of symbols of some size and pattern that creates one thematic and compositional unit. The key purpose of any web font is to obtain the reader’s interest with its shape and color and get him to read the text. A proper font allows you to deliver not only the words but even a particular atmosphere. Cool and non-regular fonts are more expressive and more noticeable, so every business tries to actively work with its original one as an integral part of their identity. The cost of customized web fonts frequently can vary from zero to hundred dollars. – Sans-serif – the symbols without dashes at the ends, which provides a more contemporary, “clean” appearance and simplifies the visual comprehension of large content fragments. – Script – lovely cursive or handwritten typefaces in which letters tend to be crossed with one another. Script is perfect for creating a classy, fun and laid back handwritten content. – Decorative fonts – designed primarily for attracting the reader’s interest or used for another particular effect or result. How Do Fonts Impact Perception of the Product or Company? When it comes to designing advertising banners, one should choose a web font really thoroughly. Promo banner creators should choose those types of web fonts that will match the mood of their advert. The web font itself does not simply bring details in a textual form but also fills it on an emotional level, if one is put to use correctly. Generally, the advertising text shows the person an outline of the company’s product/service, which signifies a properly-selected font will only help with needed aesthetic effect. How To Define Product Bundles and How Much Money Would They Cost? A font kit is simply a range of various fonts offered at a greatly reduced price. One of the benefits of getting packages is that they cost a little higher than a single font does, provided they are on discount. The average price of a font kit on our website is just $2-20. However, hurry up: the life period of each bundle lasts less than five days. I Have Not Discovered Any Desirable Fonts in This Bundle. ? If perhaps you haven’t located a suitable font inside this deal, do not lose hope! There are actually a huge selection of bundle deals from the greatest designers on MasterBundles.com. Spend some time to browse all those bundles and you can expect to uncover the perfect package! It is so rewarding to at last track down the offer that fits your creative and professional requirements. What Other Alternative Bundles Do You Offer on MasterBundles.com? MasterBundles.com present a lot of handy bundles for web designers and deveopers in addition to font packages. Those can have a great influence on your productivity in case you are a UX/UI designer or illustrator. Those are ready-made sets with premium infographic elements, vector illustrations, WP templates, and overall, web units with multiple solutions together. All of those sets are extremely inexpensive throughout the promo period, so it’s better if you monitor those offers before time runs out! MasterBundles.com is an internet marketplace. On our resource, expert designers market their masterpieces at the best prices. We offer the best deals on the market, and our products are well reviewed by customers. Go look at our blog, it is filled with valuable and inspiring content for pro designers. Furthermore, if you register for our newsletter, you’ll be the first to learn about our discounts. And we love discounts. You will always find discount coupons and promo codes offered to chop the price to a bare minimum.